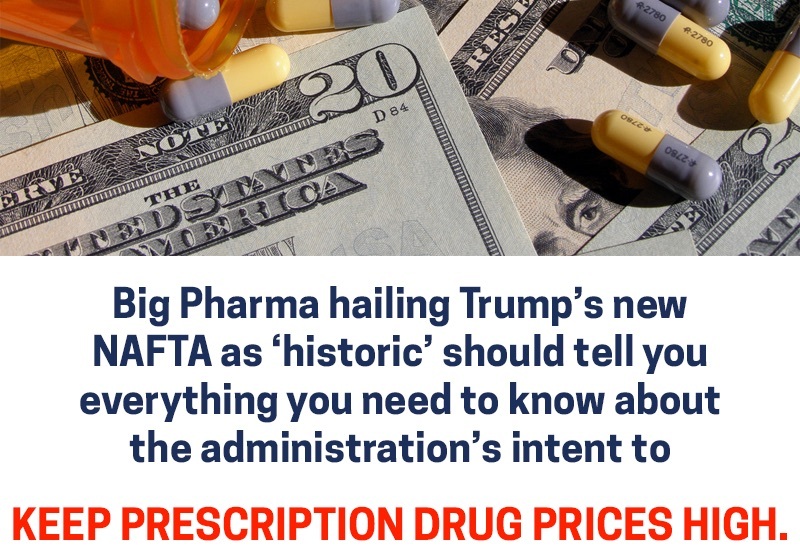 WASHINGTON—A provision of the new NAFTA that could raise the cost of certain medications in Canada has emerged as one of the major obstacles to the agreement being approved in the United States. Some Democrats are demanding a change to a rule that would require the U.S., Canada and Mexico to protect the intellectual property behind sophisticated and expensive drugs known as biologics for at least 10 years. These Democrats, like Canada’s generic drug industry, warn that the new biologics rule would keep drug prices high by requiring citizens to wait longer before they can get their hands on lower-cost similar drugs known as biosimilars. Canada would have to change its current policy: Canada currently offers eight years of the “data protection.” The U.S. would not have to change anything: under a law signed by Democrat Barack Obama, the U.S. already offers 12 years of data protection. Democrats oppose the 10-year minimum, however, because it would forbid them from reducing the U.S. protection period in the future. Former presidential candidate Hillary Clinton and current members of Congress have called for a reduction to seven years, Obama’s own preference during the original negotiations. Democrats have united in calling for additional language in the deal to allow stricter enforcement of provisions on workers and on the environment. The provision on biologics is the only one whose existing language they have called to significantly change. “The new U.S.-Mexico-Canada agreement strikes a balance between encouraging competition and incentivizing innovation, but does not impact U.S. law related to biopharmaceuticals,” a spokesperson for PhRMA, the U.S. pharmaceutical industry group, said in an email. Democrats may believe that they have politics on their side. The Washington Post reported Thursday that focus groups conducted by a prominent Democratic pollster showed that working-class white voters who voted for Obama and then Trump were furious about the provision when it was raised, seeing it as an example of political capitulation to Big Pharma. The pollster, Stan Greenberg, said that discussing this item was the “single most powerful argument” against the trade deal, the Post reported. Biologics, derived from living organisms, make up a growing percentage of the North American drug market. They include Avastin and Rituxan for certain cancers, Humira and Remicade for rheumatoid arthritis, Crohn’s disease and other ailments. During the period of data protection, data from the clinical trials conducted by the makers of the original drugs cannot be used by other companies in seeking approval for biosimilars. Because this data is costly to develop independently, extending the protection period can have the effect of giving the original company a longer period alone on the market. In some cases, it doesn’t: a drug’s patent period sometimes runs well beyond the data protection period. But in some cases where a drug takes a long time to develop, the data protection period continues after the patent has elapsed, since the patent clock starts ticking much earlier in the process. Data protection also helps the original company in cases where a patent has been invalidated or has not been secured. “It takes away any unpredictability. You know that, for that period of time, ‘I’m going to able to market my product, I’m not going to face any direct competition.’ And in their case…they would enjoy high profits,” said Jim Keon, president of the Canadian Generic Pharmaceutical Association, which opposes the proposed extension. Experts say it is too soon to know how much the change would cost Canadians if the trade agreement were implemented. “It’s going to be more money. What I don’t know is how much,” said Richard Gold, a McGill University professor and intellectual property policy expert.